I was at a yard sale and saw a chalk board and thought, “that looks like a soccer field.” Being in the midst of soccer season, I purchased the board, painted lines on it and took it out to the field. We were so impressed with what a help it was running practice and setting up plays. Fast forward a couple of years and my kids are in their first year of ice hockey. The coach is explaining a set play to them and nobody has a clue what he is talking about. I went out and purchased a sheet of ‘white board’ and made two coaching boards in our driveway with simple tools and some plastic lids. I gave these boards to two of the coaches and when I returned the next week for practice, more coaches were requesting these “awesome” boards. This initiated our looking into design and materials and prototyping, and soon we had our first Sport Write coaching board for Ice Hockey in 1995. 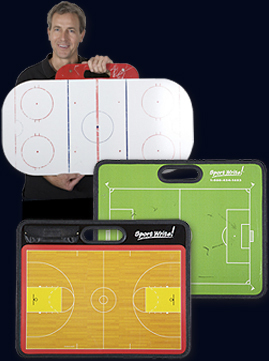 The reaction to the product was immediately positive so, using the same design, we added soccer, then basketball and continued to expand as we received requests for additional sports. we have made enhancements, but the basics are unchanged. We make large format boards that enable the entire team to see and benefit from the play. We manufacture from all first quality materials, making excellent products to help your team achieve their highest potential.